Pinterest is an online “pin board” where individuals (most users are women) “pin” images, quotes, and DIY tips for their followers to see. But this seemingly innocuous inboard has a negative side of Pinterest: Thinspiration. Thinspiration are images and media that promote anorexia and other eating disorders. In this piece, Alexa Megna explores thinspiration and asks us to think about the role media and imagery play in defining beauty standards. Ladies, we are living in a truly revolutionary time! We have laptops and iPhones to keep us constantly connected to our loved ones, because after all, relationships are most important thing to women. We can log onto Foodgawker.com or Foodnetwork.com to download recipes instantly to cook for our partner. We can also watch our favorite chick flicks, like Titanic and Moulin Rouge, in an instant on Netflix.com. In addition, we can also log onto Pinterest.com to shame not only our bodies, but also women’s bodies everywhere. Now, for all of those who are unsure of what Pinterest is let me explain. Pinterest is an online community where you can “pin” images, recipes, work out tips, and DIY secrets to an online corkboard that followers can see. Pinterest, of course, does have some men that do participate, but mostly it is a female dominated community where women can share tips and secrets with other women…. Last night watching the Super Bowl commercials, I learned a lot about what it means to be a man? Watching beer commercials, one would assume that manhood is defined by strict do’s and don’ts. In this piece, Alexa Megna illustrates how the boundaries of masculinity are narrowly defined and reinforced in beer commercials. Men who are married or in relationships are a complete drag. The ball and chain is always complaining about how you are always doing everything wrong…blah, blah, blah. Men do not scream “like a girl” on a scary rollercoaster ride. If they do, their friend’s make mocking t-shirts with his screaming face and wear them to bars. “Real men” aren’t friends with “chicks” unless they have some tasty beers. Men who are grossed out by fish are wusses. Men always up to something relatively stupid. Often you find them quietly passing gas in an elevator just for fun. Men have to watch sports with other men. Men defiantly do not enjoy wine & cheese parties. As you can see, these actual beer commercials perfectly illustrate to viewers (albeit a little ironically) how men should act, what they should buy, and whom they should find sexually attractive. They show what a real man looks like and what happens when a man doesn’t live up to these expectations (which often involves mockery and laughter at the man’s expense). These commercials portray manhood in the most stereotypical way, limiting our ideas of what a man should be…. A good man is hard to find, as Alexa Megna finds out in this piece. In recruitment for her thesis about heterosexual men in LGBTQ activism programs, Alexa struggles to understand reactions and reasons why heterosexual men in these programs are so hard to find. I’m desperately seeking allies. I’m on the verge of sitting outside the mall with a cardboard sign that reads, “Sociologist seeks heterosexual males who support the lesbian, gay, bisexual, transgender, and questioning (LGBTQ) community.” I am just looking for straight dudes who support sexual equlity for everyone. Living on the west coast often means partaking in the joys of In ‘n’ Out Burgers. One day, instead of just ordering up a Double Double, Alexa Megna received an extra side of sociology with an impromptu lesson on norms. In this post Alexa asks, what happens when things break down and we enter into the normless world of anomie. I have a confession to make. Are you ready? 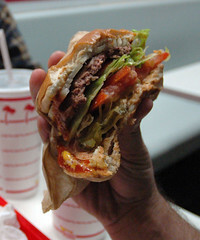 Here it is: I love In ‘n’ Out. You know the burger joint on the west coast that is infamous for it’s tasty burgers, fries, and shakes? (For all of you east coasters, it’s like a better version of Five Guys. But that’s my own bias.) One day I found myself craving a Double Double from In ‘n’ Out. I just had to have one. So as I wheeled up to the drive thru line all I could think about was the Double Double heaven I was soon to be in. Until, something funny started happing. The truck in front of me completely skipped the “Order Here” speaker box. He just drove right through. “That’s weird,” I said to myself as my turn at the box came up. Then I waited. And waited. I started looking around wondering if this was some joke. Why was the loud voice in the little box not talking to me? After looking around at the car behind me and huge expanse of space between the truck in front of me, I quietly said, “Uhm… hello?” Nothing…. “I wouldn’t be a man if I didn’t feel like this,” croons deep voiced Josh Turner in his country hit “I Wouldn’t be a Man.” He continues, “I wouldn’t be a man if a woman like you was anything I could resist; I’d have to be from another planet where love doesn’t exist.” I quickly shot a glance in my review mirror to see my little brother in the backseat quietly singing along with Turner, knowing every word to the song. Dumbfounded, I tried to decide what to say to him. Something along the lines of “uhhhh…” came out of my mouth. “Don’t listen to him, little brother. Gay men are real men too.” As I changed the radio station, he laughed and continued singing along to the next song that came on.